New Plates and Old Polish! Some of the old Sally Hansen Prisms are fantastic...I picked up a few of them last summer when the Bargain Shop was selling them in plastic pouches and have spotted some in bargain bins at flea markets and the like. **Always check out the bins or makeup sales at flea markets as you never know what you may find there! ** Here's two coats of Ruby Emerald over one coat of Illamasqua Boosh...a glorious one coat wonder! Now, onto the new plates! Some of you may know that a fellow blogger, Shirley over at Shirley's Beauty-Nails** designed her own line of image plates. I'm always on the lookout for new image plates and she has some really great and unique designs, so as soon as I had a few extra dollars, I ordered 28 of the available ones. Here's my first time using them over my mani using Orly Luxe using plate SdP B-13. My fingers were stamped this morning which was day three of this polish, so thats why its not as nice and shiny as the above pix! The pix above is in direct sunlight; the pix below is in the shade so the stamp design shows a little better. And I stumbled across a source for Anna Sui polishes a week or so ago...of course had to pick up a few and thought it would be a great time to give them a try. The sparkly thumb is Anna Sui #81. Love these rose scented polishes...but not loving the brush so much...I guess its a small price to pay for the gloriousness! Anna Sui is available at select Shoppers Drug Marts (in my area anyway). The one I visited had about 15ish different colours to chose...unfortunately the one I'm lemming the most, #300, wasn't part of the collection. Haven't used crack in a while...polish that is!! !...so when I was deciding on my next mani and seen p2 crackling silver polish sitting there, I'd thought I'd give it a try. P2 is not available in Canada, but again, I was lucky enough to swap for it. Here's Nubar Belize Coral with one coat of p2 Silver Crackling polish, with topcoat. This is before topcoat; it has a matte finish, typical of other crackle/shatters on the market. While I was putting on the crackling polish, I seen it had a slight shimmer and it had the same finish of China Glaze OMG (less the holo, of course)...which got me to thinking, wouldn't holo crackle/shatter/crackling polish just be the coolest ever? I guess if you are into crackle it would be...can you just image the combination possibilities? I guess time will tell if it ever materializes...I'm gonna keep my fingers crossed! 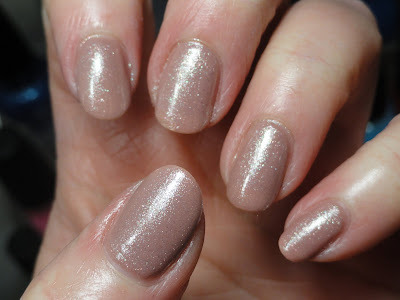 Here's a closeup of the shimmer; hopefully you cansee what I'm talking about. Here's a rare pix of my right hand...on this hand, I applied the crackling polish a little thicker, and you can see the effect is a bit chunkier. And Nubar Belize Coral by itself...this would be a perfect spring or summer polish...I can't wait to try it with some stamping! You probably know that OPI is coming out with a silver shatter; it will be interesting to see how the two compare! Hope you're having a great weekend and thx for looking! I cannot believe that I decided to stamp over Nfu oh# 51...so pretty and glowy...but its for a good cause! Tonight between 8:30 p.m. to 9:30 p.m. I'll be turning out my lights in recognition of Earth Hour. Here's my Earth Hour mani....yesterday's mani of Nicole By OPI Midnight Snowfall, topped with one coat of nfu 51 and now stamped using Nicole By OPI Positive Energy. Used IP's T37, T46, HB32, HB44, fauxnad m04, fauxnad m27, fauxnad H and fauxnad C05. Nfu oh 51 is Amazing!!! Nfu oh polishes are one of my favourites...its hard to say outright that they are my #1 all-time favourite as there are so many spectacular polishes out there, but certainly, they are near the top of my list. I think Nfu oh has some of the most unique polishes-their holo's and flaky's are bar none...and while I don't have any of their cremes, the ones I've seen in the blogesphere look great as well. I absolutely adore the bottles too...any bottle with a funky design is tops in my books! Nfu oh's aren't available at anyplace I know of in Canada; I know there are some online stores out there that sell them, but don't know if they ship to Canada. I've been lucky to swap for those that I have. A long time ago, I went to the Nfu oh's blog page and there was a note saying to email them for Canadian sellers; while they were good enough to get back to me right away indicating that they would try to locate one; no followup email was ever received...so if anyone knows where a Canadian gal can get these and they will ship to Canada, kindly let me know! I haven't decided if I'm going to stamp this...if I do, I will update the post...but for now, I'm really liking it on its own! Have a great day and thx for looking! Anyway, I've been wearing this since Monday...pretty and fairly conservative (well, really conservative for me!) but thought I'd share for anyone who may want to try this combo for work or like to wear pretty neutrals. Two coats of OPI Tickle My France-y topped with one coat of OPI Hollywood Blonde. Hollywood Blonde is pretty hard to find and of course, long unavailable by the time I had started really getting into polishes, but was able to swap for it a while back. I've also heard that Zoya Glimmer is a close dupe...I have it too but never compared the two. I thought I'd try some different type of nail art ....here's my garden of Spring flowers! Then used an assortment of rhinestones to create the flowers and butterfly. I haven't done a whole lot with rhinestones...usually just add one here or there for the centre of a flower pretty much...that's it. These two pix have had a coat of clear to hopefully keep the stones on my fingers for a day or so! I don't usually have the patience for all the stone fiddling....this didn't turn out too shabby except the ring finger...probably should have added one less stone...oh well...next time...and every mani error is just reason to redo my nails! Spring is one of my favourite times of the year! I always look at it as a time of new beginnings...and always looks forward to trees buds blooming, the tulips and daffodils sprouting and birds returning from the south! (Not to mention the start of spring means fresh maple syrup is around the corner! mmmmm!) Far too early for any of this to happen here in Ontario...but lets hope Spring is right around the corner! May You Find a Pot of Gold at the End of a Rainbow! As you may recall from my posts and some of my comments, there's only so many image plates out there with a St. Paddy's theme, so last weekend, I sifted thru all my plates to try to come up with something that weren't just all shamrocks and here's what I came up with! Used IP's H17, fauxnad m28, B05, HB44, HB30, BM03 and HB40. Stamping polishes are Konad special polishes in green, red, white, black and yellow and CND Gold Chrome. Starting at thumb and working left to right: OPI Alpine Snow matte, Essie Going Incognito, Color Club Wild Child, LA Girls Disco Brites Can U Dig It, and LA Girls Disco Brites Turntable. While last year when I seen the soft plates on their website and watched the youtube tutorial, it was not in English but looked simple enough so I bought a few to try out. Low and behold, it wasn't as simple as it looks (to me anyway!)... no matter how much fooling around with them I did, I couldn't get it. So when I went to their site a few weeks ago, I seen now that they have posted some instructions on their use in English so tried it again and was comfortable enough to attempt to try the stamp on my nails. This was the first time but now that I have somewhat the hang of it, I'm going to try them more often as they have some really cool designs on them! So here's my Leprechaun!!! It's the best I could come up with!! Happy St. Patrick's Day Eve! Two coats of Essie Going Incognito on all fingers but ring finger, which has one coat, then topped with one coat Jade Emerald Sparkle. The above pix was taken in late afternoon sunlight just a few minutes ago. This pix was taken last night after I finished mani. Stamped using IP XL F (again, I know!) using China Glaze L8R G8R for the stamp. I really liked the subtle look of the stamping against the Essie polish and in hindsight, wished I had have done all five fingers in Going Incognito, or used my thumb as the accent nail. Oh well, maybe for next year! I'm sure everyone is tired of the re-creation of the shamrock on the XL F plate-I hope to do one more mani, hopefully something different! OPI Aragon Suede for St. Paddy's Day Mani.. THIS was the polish I was searching for last time for a St. Patricks Day mani. After some stash searching, it was in my hands. After two coats of the polish, stamped with China Glaze Cheers to You and Nicole by OPI Positive Energy. I was fooling around with some polishes to see hwo they stamped and discovered Cheers to You worked not bad for stamping...and so did Midnight Kiss...they were slightly glittery; different that the sharp silver contract with my prefered go-to silver, Positive Energy. Image plates used were XL F and BM03...unfortunately, there aren't a great deal of St. Paddy's image plates out there to chose from, so these were used again! Lastly, as I didn't want to have to deal with a chipped, matte mani, decided to add a quick topcoat of CND Silver sparkle. 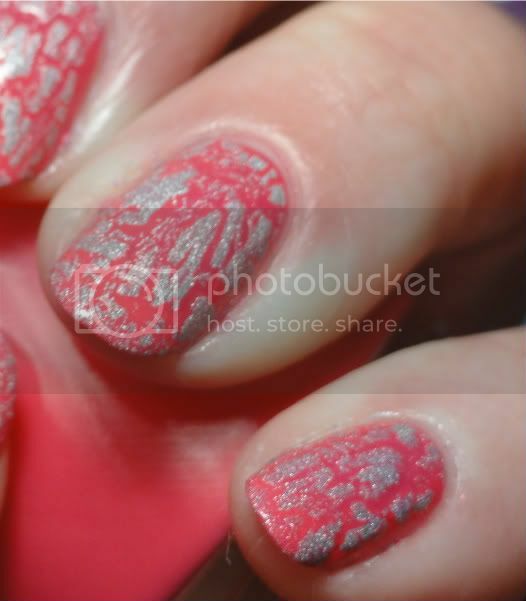 In real life, the silver sparkle isn't so obvious and you can still see the stamping but this doesn't relay in the pix! I guess St. Patrick's Day is coming up! I'm not Irish, but love themed manis so thats why I've been doing them...do you have one planned? I know I've seen some great ones in the blogesphere....and its always so interesting to see everyone's interpretation of the day! I'm not a big fan of greens and the green polish that I happen to be looking for, I couldn't locate. So going thru my stash, I came across NYX Jungle, so thought I'd give it a whirl for my next St. Patricks Day mani. 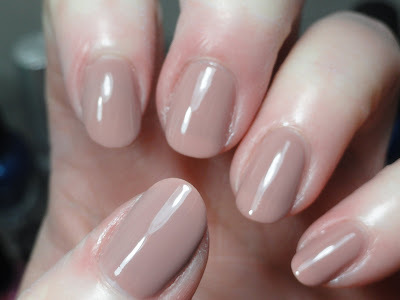 This polish is very very sheer and even with three coats, can still see VNL in certain lighting. You are looking at three coats. It has an interesting gold shimmer that peaks thru...I liked the smooth application (a little on the runnier side but I had no issues applying it) and the kind of shimmer finish that is easier (for me) to clean up so I was happy as I'm still working on my cleanup skills! Stamped using CND Gold Chrome using BM3 plate and for a bit of interest, used Nubar Martini glitter on the tips. I intially tried Lippmann Boom Boom Pow for the gold glitter interest, but it was too yellow making the tips turn lime green and not enough glitter (at least what I had envisioned in my mind) so opted for Nubar Martini instead. Hope you have a great weekend and thx for looking! Last night found me with a bit of free time, so I thought, why not do another Mardi Gras mani? Used same plates as last mani as their aren't too many image plates out there for this theme and I'm just not creative or talented enough to do anything freehand! IP's Konad m77, fauxnad m19, fauxnad T20 and fauxnad T39. All images were stamped with China Glaze 2030. I wish I had enough more colours like the deep finish found in these Cheeky Monkey polishes--love love love them! Any recommendations? I'd love to know your suggestions! The above pix was taken the morning after doing mani in nature daylight. IP used were Konad m77, fauxnad m19, fauxnad T20 and fauxnad T39. Stamping polishes were Konad Green, Royal Purple, Violet Pearl, Beautiful Scratchers Iron Red, Sally Hansen Royal Purple Chrome and CND Gold Chrome.